The major vessels of the coronary circulation are the left main coronary that divides into left anterior descending andcircumflex branches, and the right main coronary artery. The left and right coronary arteries originate at the base of the aorta from openings called the coronary ostia located behind the aortic valve leaflets. The left and right coronary arteries and their branches lie on the surface of the heart, and therefore are sometimes referred to as the epicardial coronary vessels. These vessels distribute blood flow to different regions of the heart muscle. When the vessels are not diseased, they have a low vascular resistance relative to their more distal and smaller branches that comprise the microvascular network. As in all vascular beds, it is the small arteries and arterioles in the microcirculation that are the primary sites of vascular resistance, and therefore the primary site for regulation of blood flow. The arterioles branch into numerous capillaries that lie adjacent to the cardiac myocytes. A high capillary-to-cardiomyocyte ratio and short diffusion distances ensure adequate oxygen delivery to the myocytes and removal of metabolic waste products from the cells (e.g., CO2 and H+). Capillary blood flow enters venules that join together to form cardiac veins that drain into the coronary sinus located on the posterior side of the heart, which drains into the right atrium. There are also anterior cardiac veins and thesbesian veins drain directly into the cardiac chambers. 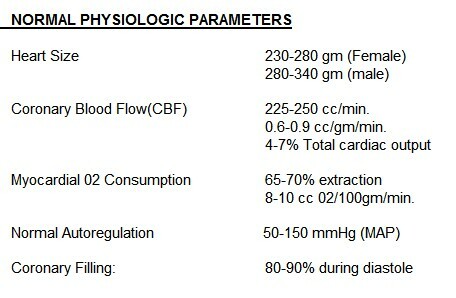 Although there is considerable heterogeneity among people, the following table indicates the regions of the heart that are generally supplied by the different coronary arteries. This anatomic distribution is important because these cardiac regions are assessed by 12-lead ECGs to help localize ischemic or infarcted regions, which can be loosely correlated with specific coronary vessels; however, because of vessel heterogeneity, actual vessel involvement in ischemic conditions needs to be verified by coronary angiograms or other imaging techniques. Flow is tightly coupled to oxygen demand. This is necessary because the heart has a very high basal oxygen consumption (8-10 ml O2/min/100g) and the highest A-VO2 difference of a major organ (10-13 ml/100 ml). In non-diseased coronary vessels, whenever cardiac activity and oxygen consumption increases, there is an increase in coronary blood flow (active hyperemia) that is nearly proportionate to the increase in oxygen consumption. Good autoregulation between 60 and 200 mmHg perfusion pressure helps to maintain normal coronary blood flow whenever coronary perfusion pressure changes due to changes in aortic pressure. Adenosine is an important mediator of active hyperemia and autoregulation. It serves as a metabolic coupler between oxygen consumption and coronary blood flow. Nitric oxide is also an important regulator of coronary blood flow. Parasympathetic stimulation of the heart (i.e., vagal nerve activation) elicits modest coronary vasodilation (due to the direct effects of released acetylcholine on the coronaries). However, if parasympathetic activation of the heart results in a significant decrease in myocardial oxygen demand due to a reduction in heart rate, then intrinsicmetabolic mechanisms will increase coronary vascular resistance by constricting the vessels. Progressive ischemic coronary artery disease results in the growth of new vessels (termed angiogenesis) andcollateralization within the myocardium. Collateralization increases myocardial blood supply by increasing the number of parallel vessels, thereby reducing vascular resistance within the myocardium. Extravascular compression (shown to the right) during systole markedly affects coronary flow; therefore, most of the coronary flow occurs during diastole. Because of extravascular compression, the endocardium is more susceptible to ischemiaespecially at lower perfusion pressures. Furthermore, with tachycardia there is relatively less time available for coronary flow during diastole to occur – this is particularly significant in patients with coronary artery disease where coronary flow reserve (maximal flow capacity) is reduced. In the presence of coronary artery disease, coronary blood flow may be reduced. This will increase oxygen extraction from the coronary blood and decrease the venous oxygen content. This leads to tissue hypoxia andangina. If the lack of blood flow is due to a fixed stenotic lesion in the coronary artery (because of atherosclerosis), blood flow can be improved within that vessel by 1) placing a stent within the vessel to expand the lumen, 2) using an intracoronary angioplasty balloon to stretch the vessel open, or 3) bypassing the diseased vessel with a vascular graft. If the insufficient blood flow is caused by a blood clot (thrombosis), a thrombolytic drug that dissolves clots may be administered. Anti-platelet drugs and aspirin are commonly used to prevent the reoccurrence of clots. If the reduced flow is due to coronary vasospasm, then coronary vasodilators can be given (e.g., nitrodilators, calcium-channel blockers) to reverse and prevent vasospasm.